South Bend's new police chief, Kurt Matz, is still reeling after a summer full of exciting new changes. "My first grandson was born on July 30, and three days later, I was offered the position of Chief of Indiana University Police Department at IU South Bend," he said. "All of these happy events were just swirling around all at once." 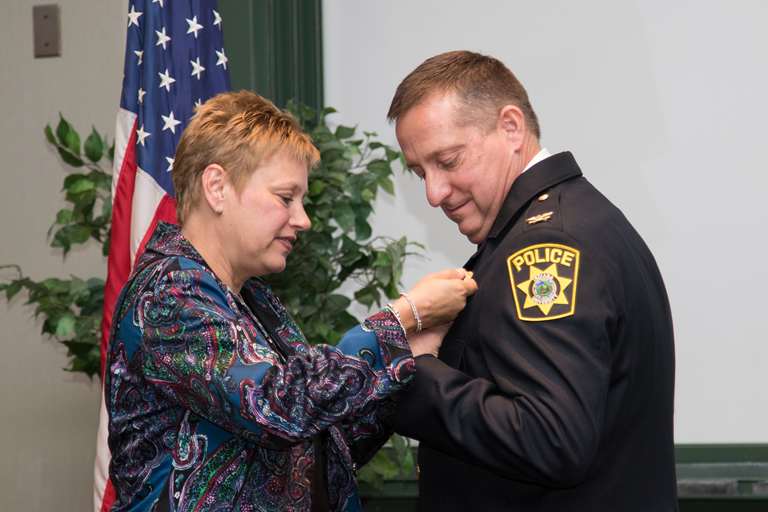 Prior to joining the IU Police at IU South Bend, Matz served for 32 years in the Munster Police Department, most recently as a lieutenant and patrol division commander. His first law enforcement position was at IU Northwest. "I was looking for a new opportunity to lead," he explained. "I'm excited to be back in a university setting. A big upside to the position is it allows more opportunity for me to get out of the office and engage with students, faculty, and administrators," he said. A long, successful career in law enforcement and his personable nature made Matz an ideal candidate to lead the campus police department according to IU South Bend Chancellor Terry L. Allison. "Chief Matz's approachable manner will contribute to community engagement efforts, where the police, campus, and community work together to continue to make IU South Bend a safe place to study and work," said Allison. The new police chief is responsible for 12 full-time IU South Bend police officers and additional staff. He provides leadership, direction, and oversight for all campus enforcement functions. In addition, he serves on various university, local, and state law enforcement committees and acts as a liaison between the campus department and local municipal agencies and courts. Matz earned a Master of Public Affairs with a focus on law enforcement from IU in 1993, and an undergraduate degree in criminal justice from Saint Xavier University. "I love working in law enforcement," said the new chief. "Even as a young child, I wanted to be a cop." During his swearing in ceremony, which was attended by his family, including his nine-week-old grandson, Matz commented, "Everyone I have met at IU South Bend has been friendly and welcoming. My wife and I are excited to join IU South Bend and be a part of this community."